Perfect for die-cutting or inking. 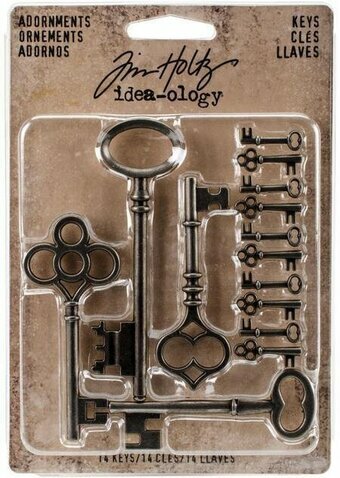 Advantus-Idea Ology Metal Adornments: Silver Keys. Perfect to use as decorative ornaments! This package contains fourteen metal keys in two different sizes. Imported. ADVANTUS-Tim Holtz Idea-Ology Muse Tokens. These tokens are 7/8in and each is stamped with a word: Genuine, Knowledge, Thoughts, Courageous, Lifetime, Moments, Wonderful, Forevermore, Unique, Excellence, Journey and Significant. Twelve tokens in all. A great way to dress up your projects. Imported. The Industrious collection features embossed cardstock stickers with a gun metallic finish. Advantus-Idea Ology Ephemera. The perfect additions to all your paper crafting projects! This 8-3/4x5 inch package contains seventy printed memorabilia die-cut pieces in an assortment of sizes and shapes. Imported. An eclectic collection of printed memorabilia including vintage ads, cards, tickets, brochures and other fun bits. A continuous sheet of printed, translucent tissue; the perfect accent for wrapping any surface. Use it to create collage or layered effects. Can be colored with inks, paints and more. Dispenses easily from a box similar to waxed paper.